THE DAILY PIC: Using some folds of drapery, Brown calls out the king as a sissy. THE DAILY PIC (#1478): Okay, so maybe I’ve got a dirty mind, but I can’t keep my eyes off the … feminine (shall we say Georgia O’Keeffe-ish?) folds that sit between the legs of the male figure in the middle of this painting. (When you see the huge canvas in person, your glance falls right at the level of those folds – click on my image to see it enlarged.) 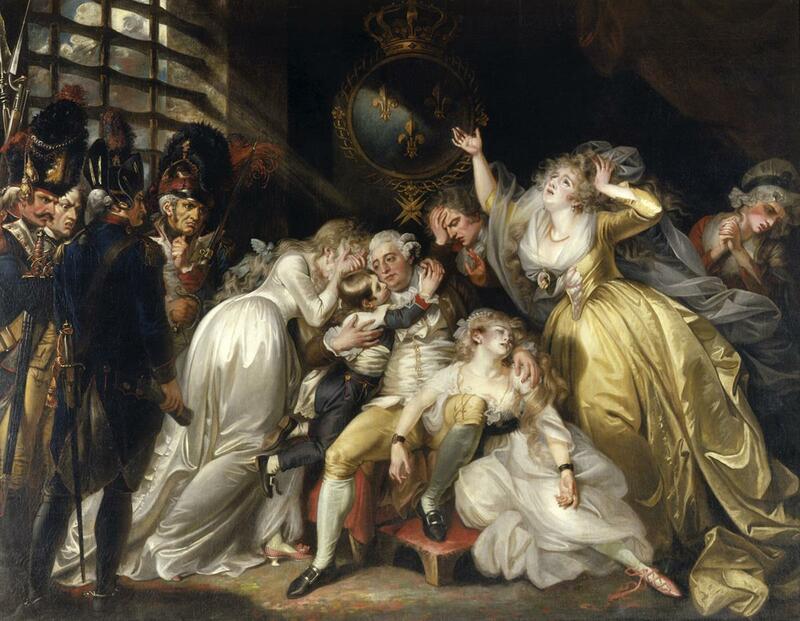 That seated figure is the king of France, and the painting is called Louis XVI Saying Fairwell to his Family. It was made by the American artist Mather Brown a few years after the French Revolution, while he was living in London, and I saw it some weeks back at the Wadsworth Atheneum in Hartford, Conn.
For all the sympathy the painting clearly shows toward its beleaguered royals, I wonder if those folds don’t betray a touch of criticism. Following the era’s standard English line, they hint that if the Bourbons had been a touch less effeminate, less Frenchy-fancy – a touch more British-Bulldog, that is – they would never have come to their sad end. Louis, after all, is shown immersed in a sea of feminine frippery, while his tall-hatted captors, however hateful, come off as properly masculine and … er, erect.